The Palmyra castle or Fakhr-al-Din al-Ma’ani Castle has been built by the Mamluks in the XIIIth century on a hill overlooking the antique city of Palmyra. Since 1980, the castle and Palmyra are both inscribed on UNESCO’s World Heritage List. In 2013, due to the outbreak of the Syrian civil war, the site has been inscribed on UNESCO’s World Heritage sites in Danger list. In May 2015, the castle has been taken by ISIS troops. The site is indeed strongly fortified and strategically located. During the Palmyra offensive in march 2016, the Syrian government’s army succeeded to retake the city but the castle was unfortunately damaged : the stairway leading to the entrance is now completely destroyed. 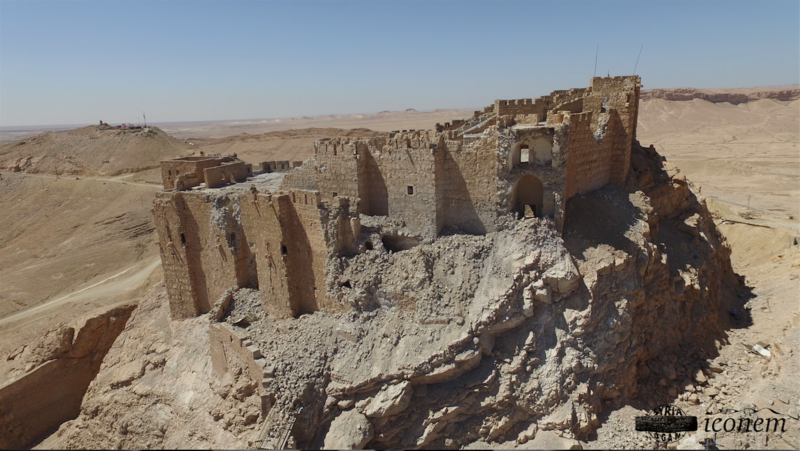 However, the structure remains mainly intact and Syrian Director of the DGAM, Maamoun Abdelkarim, declared that the castle was going to be restored. In partnership with the DGAM, ICONEM contributes to the castle’s documentation by carrying out 3D models representing the castle before and after the conflict, which will be given to archeologists and restorers.